Yes, but How Does it Make You Feel? 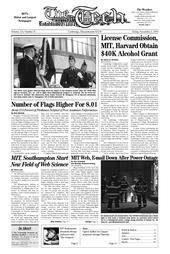 Like any reputable cult or gang, MIT requires something extreme of all its potential undergraduates. In high school, some of us excelled at several simultaneous AP classes. Some of us participated in several student organizations. Some of us were masters in several creative arts. Whatever our individual talents and superpowers, we’re here, and we’re now forced to reconcile our high school passions with our MIT lives. For the AP stars, the academic adjustment is welcomed and taken in stride. Hundreds of student groups offer a variety of leadership and volunteering opportunities abound for the civic-minded. But for the visual artist, the options at MIT are more limited. Before undergraduate students and administrators scramble to decide the best combinations of classes to require, they should address serious issues with the current classes themselves, particularly within the visual arts department. I was once a model of the classic, self-driven, over-subscribed high school student. But when I dropped my beloved extra-curriculars to focus on taking college classes my senior year, I enrolled in one extra class – Pottery. It was a strange choice, but saved my sanity. So as a freshman, Introduction to Visual Arts (4.301) seemed like an exciting and logical HASS-D choice. While the syllabus varies from term to term, during the semester I was enrolled, lecture consisted of three hours of video twice a week. This wasn’t video that my poor freshmen eyes were prepared for – videos ranging from the dull and boring to sado-masochistic hooks, pulleys, and unsuspecting viewing publics. Assignments included our own video project, “body extension and performance art,” and “public art” (or the “sanctioned hacks” that sprinkle the Infinite at the end of each semester). Guest critics came and mutilated our use of fluorescent light (among other things we were not taught), and everyone pretty much left knowing about as much as they came in. Even within the assignments we discussed, we were only exposed to final products, with no discussion of design, theory, or skill. Rather than letting one introductory class ruin a department for me, I owed myself another chance. Sculpture (4.322) seemed to have a much more precise course description, and judging by the title, this class would at least spare me the bizarre video projects. I was wrong. The professor, another professional artist, earned her reputation in performance art. Thus, many of our lectures consisted of videos of her performances. Eventually, the class figured out that we could avoid contributing real effort by conjuring tales of personal hardship and gender discrimination, and our already abysmally uninformative lectures became therapy sessions. All in all, what I’ll remember most about the class was the video of naked female Harvard professors running up and down stairs. What that has to do with sculpture, I may never know. Why are MIT’s visual arts course offerings so abysmal? The Institute prides itself on analysis and technique, yet both are completely absent from the visual arts curriculum. Is art too unscientific for MIT culture? Not at all – our music and theater classes offer an array of new skills and opportunities for practice. People get excited about music and theater at MIT. There are enough classes and student groups to pack the existing performance spaces and then some. People speak excitedly about their music classes. These are things worth looking forward to. This is not the case with the visual arts. Having exhausted the MIT course offerings, I followed my friends’ advice and cross registered for a class at the School of the Museum of Fine Arts. Somehow, I managed to find another class devoid of skill and instruction, but basing my course selection on Project Runway might have given me unrealistically high expectations. First off, “MIT student in a fashion class” is a clich waiting to break into mainstream vernacular. Secondly, the assignments lacked intellectual merit. Our first homework assignment was an exercise in pattern-making: take a box, fold it out, trace it, and make a copy. To jazz it up, we were assigned to put a lie inside it. I went with the old “light bulb box with burned out bulbs.” The other projects ranged from “tribute to my child molesting grandfather” to the personal battles with a variety of disorders. I dropped the class. I can’t help but wonder: is this how the typical MIT student feels about visual art? If the visual arts are perceived by the student body as sitting around and talking about feelings, then no wonder there’s so little demand for visual arts class. The visual arts department is only reinforcing this stereotype by offering classes that are unapproachable. MIT students enjoy getting their hands dirty — sitting in a lab for several hours working on a labor of love is not a foreign concept to us. We want to think, and we want to have something cool to show our friends when we’re done. Most importantly, we want to learn something new. Offering classes that teach bona fide skills would draw more willing students to the HASS department than any GIR-restructuring. You don’t think that MIT students like visual arts? Then show up for the glass lab lottery and see over a hundred people get turned away. Just try and get into a pottery class. In both cases, students do not get any academic credit, but still they try and try again to squeeze into the limited offering of hands-on, skill-imparting visual arts classes. Why must students give up their free time to compete for visual arts classes when there’s a whole department that’s designed to teach this subject? Before running off to redesign the HASS requirements, it might be advantageous to examine the classes currently being offered. To offer a narrow range of subjects is uncharacteristic of MIT. Relying on other schools to teach diverse classes like drawing and painting might seem efficient, but even Harvard teaches calculus. The visual arts department needs to rethink its direction and purpose, and offer more skill-based instructional classes to appeal to the less artistically inclined.